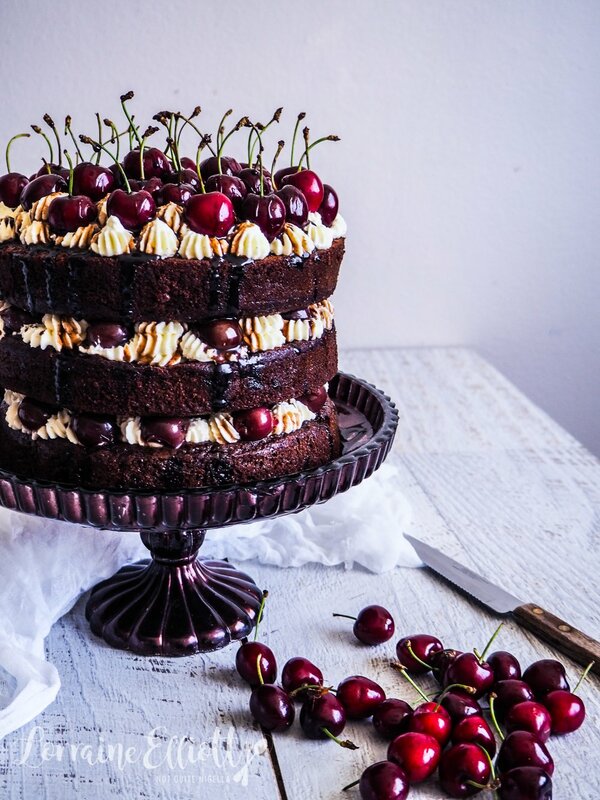 Cherry Spectacular Black Forest Cake! 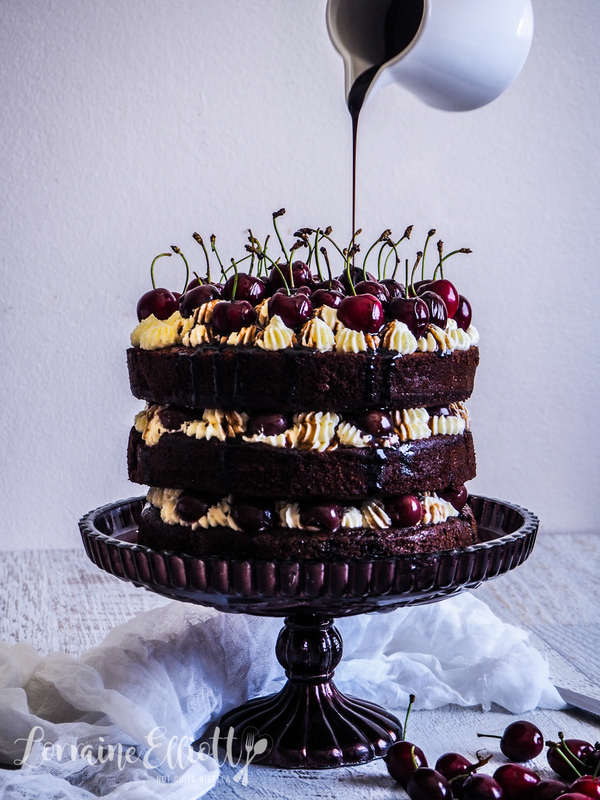 Want to make a dreamy Black Forest Cake for Christmas? 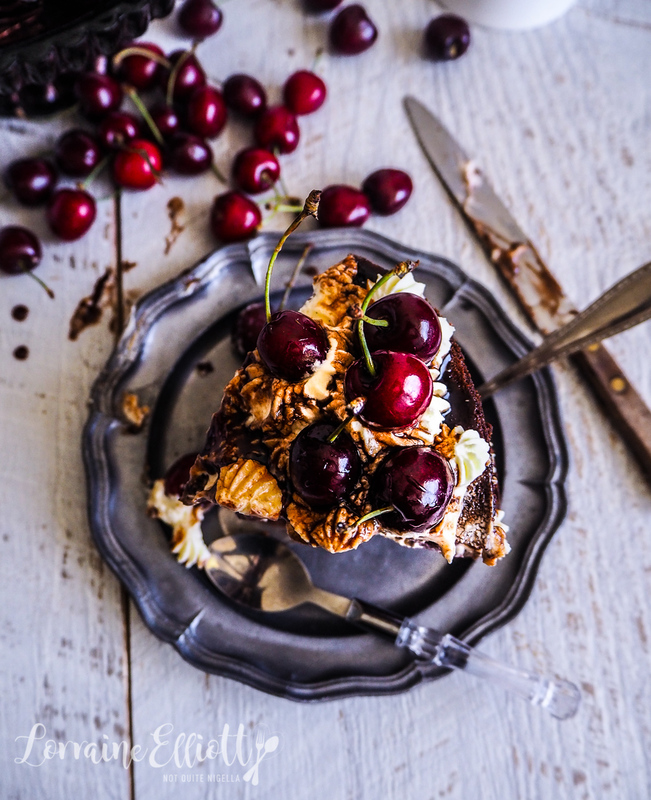 One where moist layers of chocolate cake are brushed with kirsch cherry syrup, topped with whipped cream and sour or morello cherries? This one also has a top layer of fresh cherries as well as a divine chocolate cherry liquid ganache! I called her Angelika. 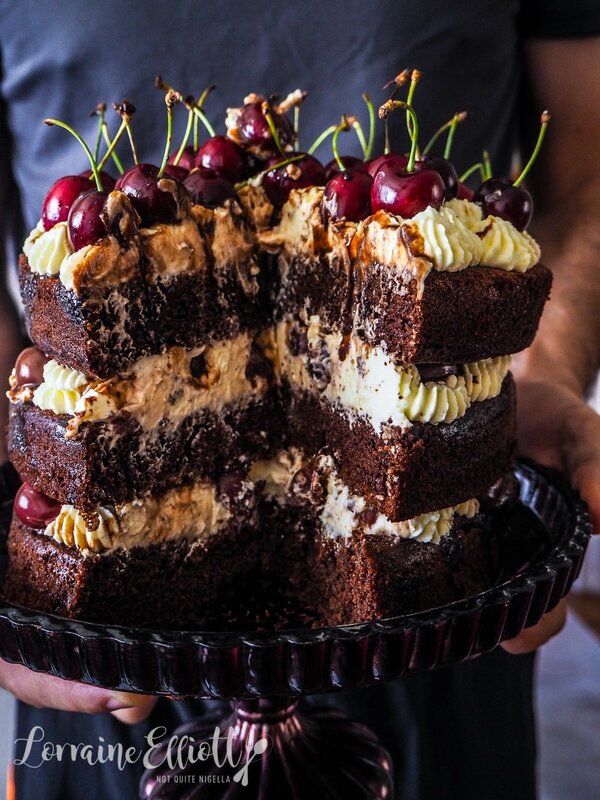 Oh Black Forest Cake. What a dreamy cake this is and when a friend asked if I had made one (I think it was a hint) I had to confess that no I hadn't. 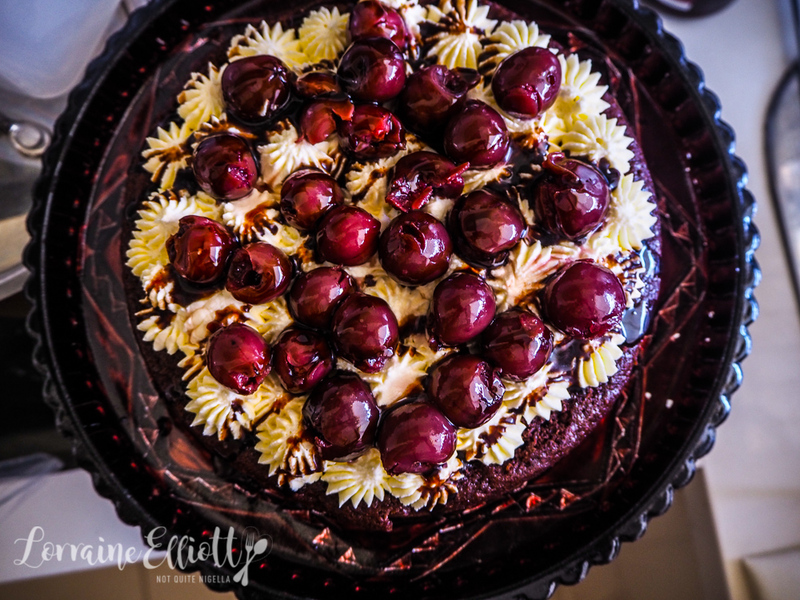 I had certainly made a Black Forest Cherry Cheesecake but a regular one? No. 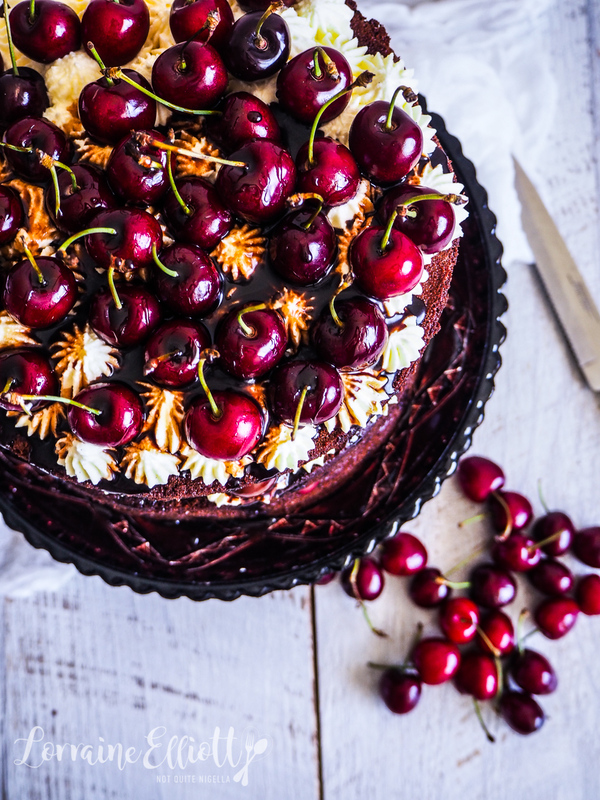 And now that it is cherry season it seemed like the perfect time to do it and with Christmas coming up it is the perfect time for a show stopping cake to feed a crowd. 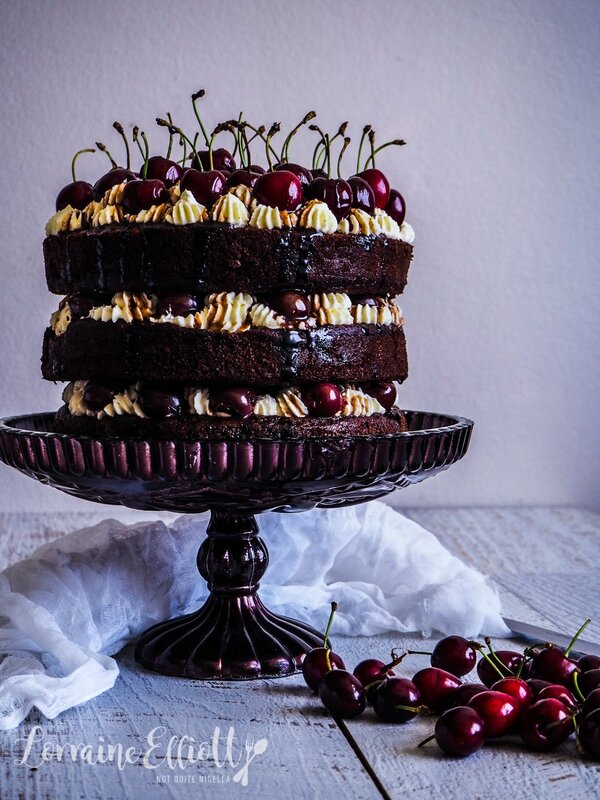 The chocolate cake itself is very moist and the cherry kirsch syrup adds to the cake's wonderful texture. The cherries have a gorgeous soft texture especially when paired with the whipped cream while the crown of fresh cherries is made to be plucked off the top. I think my favourite component though is the chocolate cherry sauce which also doubles as an excellent edible Christmas gift. Please make extra of this if you can and you may find yourself like me, eating it straight from the jar with a spoon while sitting by the Christmas tree. This cake will be served at Christmas Eve dinner. This Christmas we will have the usual Christmas Eve dinner at our place with my extended family. Then on Christmas Day we will go to the Central Coast with my immediate family to spend the day with Mr NQN's extended family. Boxing Day is usually bought in Chinese food with my parents and sister because everyone is exhausted and sick of ham. The upcoming Christmas and holidays recently flummoxed my parents. After years of cajoling they finally got into What's App ("These messages are free?" they said in wonderment). 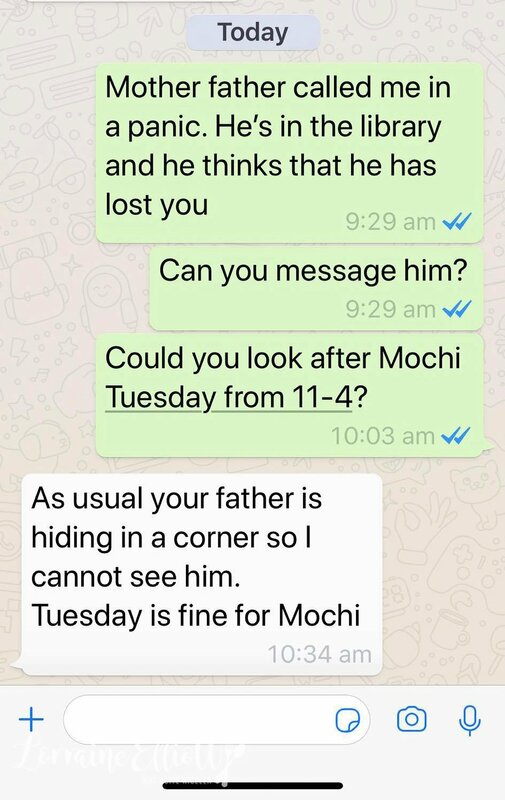 But when I was in Brisbane I got a message from my father. Actually first I got a missed call from him that only rang a couple of times (he does that so I'll call him back and he doesn't deplete his $20 phone credit). It turned out he had lost my mother in a shopping centre. He had tried calling and messaging her but she hadn't replied. So he wanted me to call her and message her (although I'm not sure how that would have helped). I tried doing both but she wasn't responding. I told him not to panic but knew that it would be fine too because my dad always carries a $10 note with him so he can get home from anywhere. Plus they had driven there. I knew that my mother would be rolling her eyes at him and he was probably in trouble for getting me involved. While I waited for them I shared the messages on my Instagram stories and the messages came thick and fast from people who have similar situations with their parents. Screengrabs were sent with funny conversations between parents and children. A few minutes later I got a message back from him. He had located her! And then later I got a message from my mother. I think she was more embarrassed than anything. He was apparently hiding in the corner quietly so she couldn't see him waiting! So tell me Dear Reader, do the holidays send you into a bit of a tizzy? Have you ever gotten lost or separated from your group? And do you like Black Forest Cake? To make 1 cup of cake flour, measure 1 cup of plain all purpose flour and replace 2 tablespoons with cornflour or fine cornstarch. Step 1 - Preheat the oven to 160C/320F. Grease and line 3x 20cm/8 inch round tins. Whisk the flour, bicarb, cocoa and sugar together in a large bowl. Add the butter, eggs, vanilla and sour cream to a food processor and process until well incorporated and then pour into the bowl with the flour mixture and mix with the water and chocolate chips until just combined. Step 2 - Divide among the three tins (I used a scale because I wanted it to be even as the layers will show). Bake for 1 hour or until the centre springs back when pressed. Cool completely and trim the top. I find these cakes easiest to work with if the layers are frozen as it is a moist cake so I wrap these individually and freeze them until needed. Step 3 - Make the syrup. Boil the cherry juice, sugar and 1/4 cup of kirsch together until reduced by a quarter or so or becomes like a glossy syrup. I also add a tablespoon or two of kirsch for an alcoholic hit at the end. Reserve around 2/3 cup of this to make the chocolate cherry syrup below (do it while the syrup is hot). You'll use the other 1/3 cup cherry syrup to brush on the cake - cool this. Step 4 - Make the chocolate cherry syrup. Place the milk chocolate in a heatproof bowl. 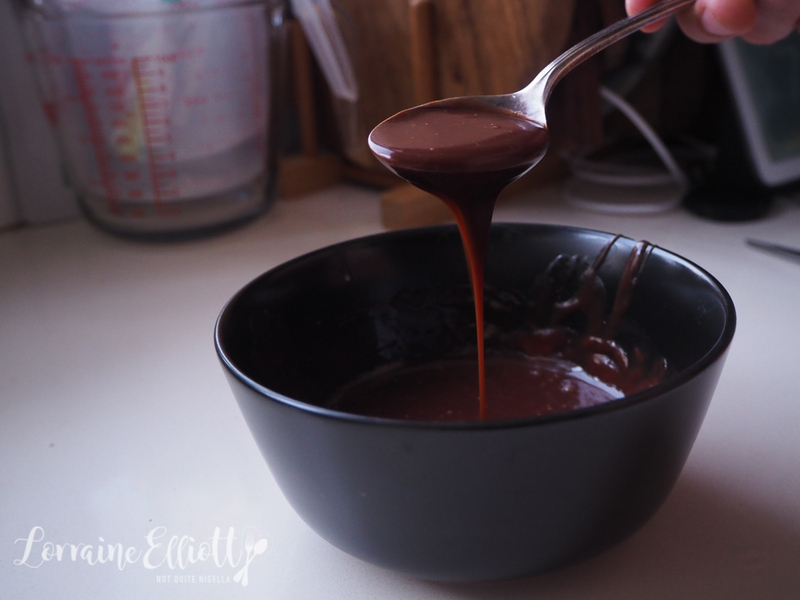 Add the quantity of hot cherry syrup to the chocolate to melt the chocolate and stir to melt. This will be your chocolate pouring syrup. If you syrup sets firm in the fridge you can gently heat it in the microwave so that it becomes liquid again. Step 5 - Make the cream (do this when you are ready to put the cake together). Sprinkle gelatine over 1/2 cup of the cream and microwave and stir until smooth. Allow to cool until lukewarm and then whip with the rest of the cream, sugar and vanilla until of a pipeable consistency. Step 6 - When ready to put the cake together, place one cake layer on a serving place. Brush the cake with the cooled cherry syrup. Then pipe the whipped cream on top. Divide the jarred cherries in half and place half of the cherries on top of the whipped cream and then drizzle with the chocolate cherry syrup. Repeat again with the second layer. Then pipe cream on the third and top layer and top that with fresh cherries and chocolate cherry syrup. To cut, serve each slice as a single layer slice and it can feed up to 24 after a big Christmas meal. featureA Royal Wedding Special: Queen Elizabeth II's Own Pudding Recipe! feature A Royal Wedding Special: Queen Elizabeth II's Own Pudding Recipe!